Goodreads Summary: Set in gilded age New York, These Shallow Graves follows the story of Josephine Montfort, an American aristocrat. Jo lives a life of old-money ease. Not much is expected of her other than to look good and marry well. But when her father dies due to an accidental gunshot, the gilding on Jo’s world starts to tarnish. With the help of a handsome and brash reporter, and a young medical student who moonlights in the city morgue, Jo uncovers the truth behind her father’s death and learns that if you’re going to bury the past, you’d better bury it deep. Why I'm Waiting For It: I absolutely loved Donnelly's Revolution so when I received the book from Teenboard to review I was beyond happy! 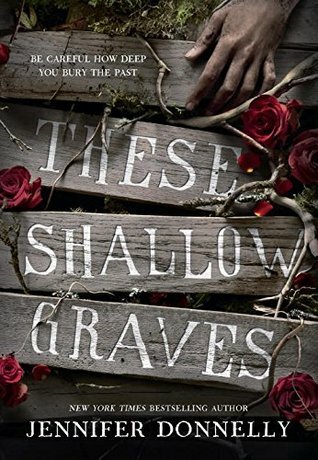 These Shallow Graves sounds amazing and I love how it is set in the gilded age New York. But also the topic of dealing with the past and secrets. I already expect this one to be mind blowingly amazing! And if you haven't picked up Revolution from her, you must! I keep waiting and waiting for this one. It's one of my favorite covers this year! Everything about this sounds awesome. I love Jennifer Donnelly, too. I'm really looking forward to it. Great pick! I loved Revolution too and am also looking forward to reading this! Marvel Strike Force Hack - GET Free Gold and Power Cores for you device Android or iOS !